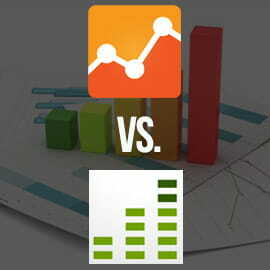 Google Analytics vs. Adobe SiteCatalyst — Which Data Analysis Platform is Better for Business? Whether you’re looking to boost sales, capture more visitors or identify a new market segment, data analytics software provides a near endless supply of information and insights to help you maximize your marketing ROI. Two of the most commonly used analytics software programs are Google Analytics and Adobe SiteCatalyst. Each has its pros and cons, but deciphering between the two can be confusing and time consuming. So we’ve done the dirty work for you. We’ve matched the big hitters of analytics against one another in four decisive rounds to help you discover which analytics software, Google Analytics or SiteCatalyst is best for your business. Google Analytics is free and will process up to 10 million hits per month. Google Analytics Premium offers a number of enhanced features such as processing 1 billion hits per month, more customization, and strong technical support, but it costs a flat $150,000 annually. In stark contrast to free Google Analytics, SiteCatalyst will likely cost you well over $100,000 per year. Cost varies according to traffic volume and the service level, and depends on the needs of your company. You have to call for a quote. SiteCatalyst does not have a monthly hit limit. Google Analytics “Real-Time” allows the user to see how many people are on their site at that moment, what traffic sources referred them, where they are located geographically and what content they are viewing. Real-Time lets the user immediately discover what daily promotions, content, Facebook posts or tweets are driving the most traffic their site. SiteCatalyst (version15) offers “Current Data” reports that provide low latency real-time reporting. Current Data reports allow the user to view nearly real-time data on traffic reports, and about a 20 min delay on conversion data. This enables the user to check the effectiveness of a cam­paign or piece of con­tent almost immediately after it launches. Google Analytics does not provide a chat or support line, but does have an official User Forum, Help Center and a “Digital Analytics Fundamentals” course. The three week course helps students understand the core principles of digital analytics, and how they can be used to enhance business performance. For users who want to learn even more about Google Analytics, there is the Analytics Academy. This free online tool offers more in-depth training in Google Analytics and data analysis. Google Analytics Premium provides access to experts in account management, implementation and training as part of its Premium service. SiteCatalyst offers 24/7 support and account management, but training is an additional fee. For those who prefer to track down solutions online, a wealth of SiteCatalyst videos, guides and tutorials are offered through Adobe for free. Google Analytics is easily implemented on your website, and requires no IT skills. In fact, it’s usually as simple as applying the Google Analytics Java Script to your site. For those looking to get the most out of Google Analytics, custom implementation is an option. SiteCatalyst’s involved implementation demands the skills of a trained professional and requires a significant amount of upfront work. However, due to the fact that implementation is highly customized, the data SiteCatalyst gathers will be tailored to your specific metric needs and possibly more valuable than what you’d get from Google Analytics. Google Analytics allows you to set custom variables, but only allows up to five per page. Variables can be set to expire at different times, such after a page view, completion of an event, or at the visit level. SiteCatalyst allows up to 75 traffic variables, plus 100 event variables, and 75 conversion variables. Variables can be set to capture whatever data you want, and can expire after a specific time (just like Google Analytics) but they can also be stacked on top of each other, giving you the chance to identify a sequence of events. Google Analytics keeps data up to 25 months. SiteCatalyst keeps all website data collected as long as you’re a customer. Now that you know more about the advantages of Google Analytics and Adobe SiteCatalyst, which one is your business most likely to use?